The York Hotel at King and Berkeley was one of the first hotels in Toronto. Opened 1805, just 12 years after the founding of the Town of York, the timber-framed, two-storey building briefly housed the Upper Canada legislature meetings after the first parliament building was destroyed during the American occupation of the town in 1813. Today, the site is a the construction site for the Globe and Mail Centre. Though no longer operating, a small number of hotels from the York Hotel era survive. Montgomery's Inn at Dundas West and Islington dates back to 1832. Lambton House (1847) and the Miller Tavern (1857) are still standing, but no longer accepting overnight guests. Here's a look back at five of the oldest hotels still in business in Toronto. Opened in 1889 opposite the now-defunct Parkdale train station, the Romanesque Revival-style building catered mostly to commercial rail travellers in its early years. According to the historical plaque mounted to the building, the Royal Winter Fair touted it as "the only safe place for one's Great Aunt to stay alone." It was renovated in 2000 and is now owned by the Zeidler family. 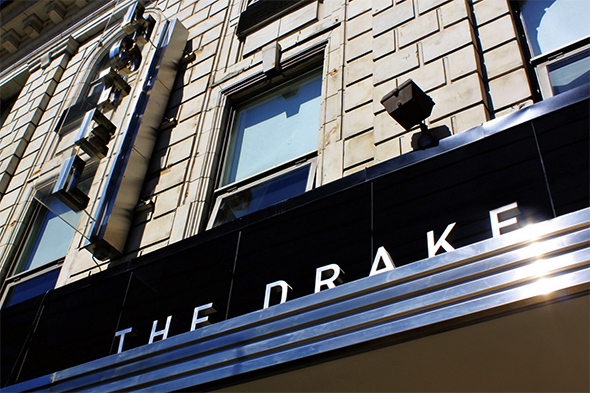 Like the Gladstone, West Queen West's Drake Hotel was built to take advantage of the nearby Canadian Pacific passenger traffic. Originally called the Daniel A. Small Hotel, it opened in 1890, less than a year after its slightly older neighbour to the west. The Drake went by various names, including (delightfully) the Stardust. The building was restored to its current glory in 2001. For much of its lengthy history, the Waverly has provided critical low-cost housing to a core group of long-term residents, which at one time included renowned poet Milton Acorn. It's now threatened with demolition -- the city refused to add the building to its Inventory of Heritage Properties in 2014 -- and a 20-storey student residence could soon be built on the site. Financed by George Gooderham, the son of the Gooderham & Worts distilling company, the venerable old King Eddy turned 116 years old this year. The oldest part of the building was partly designed by E. J. Lennox, the architect responsible for Old City Hall and Casa Loma, and on opening day it included a room filled with palm trees and a billiard hall. A 500-room extension was added 1921. Opened in 1909 as the Hotel Mossop, the 8-storey brick hotel was touted for its fireproof design. In 1904, a large portion of downtown around Bay and Front burned to the ground, so safety was top of mind among patrons. A plan to double the height of the hotel proposed in 2013 appears to have stalled. Follow Chris Bateman on Twitter at @chrisbateman. Images: Gladstone: Toronto Public Library, S 1-1072; Drake: RuthMaria; King Edward: City of Toronto Archives, Series 330, File 407; Hotel Victoria: Construction: A Journal for the Architectural Engineering and Contracting Interests of Canada, November, 1909.